Absolute Building Concepts, LLC provides quality workmanship and construction management, both in residential and commercial, to the Greater Kansas City area. We staff two full time certified, licensed general contractors, an interior designer, and a team of carpenters. Not sure whether we'll be interested in your project...call us. We're always up for a challenge, and because of our wide range of expertise, we are able to make your imagination become reality. With Absolute Building Concepts, LLC, it's "You Imagine It...We'll Build It"
Absolute Building Concepts, LLC began in March of 2003. 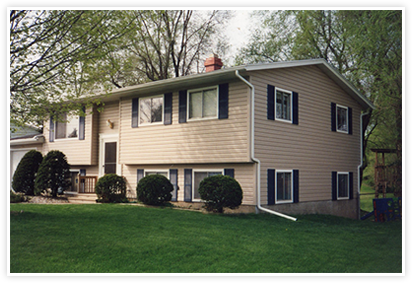 Throughout the years we have managed millions in residential and commercial projects. Absolute Building Concepts, LLC is fully licensed and insured, and certified through the International Code Council as a Certified General Contractor. New and returning customers of A.B.C continue to put their trust in, not just an honest and friendly contractor, but a dedicated team of quality minded individuals. Absolute Building Concepts employs its own staff which is able to take on substantial sized projects, ranging from residential and commercial multi-phase remodeling projects to the small maintenance jobs with which everyone eventually needs help. Our employees are very knowledgeable and highly skilled in the construction industry and have a true desire to provide each customer with an excellent experience. In addition Absolute Building Concepts is able to oversee large projects using like-minded quality sub-contractors who also have established themselves as leaders in their fields. We treat every customer with respect and every project with the highest degree of professionalism. Our customers regularly give us the keys to their home and office; whether they are gone for the day or out of town for a month, they know that we will honor their trust in our integrity. Mission Statement: Absolute: means the best...Always require and achieve the "Absolute" best. Building: refers not only to the construction industry, but also, as we go through life ..
Absolute Building Concepts, LLC can help keep your family or coworkers safe. We specialize in installing Emergency Security Preparedness Safety Shelter’s. This Safety Shelter can be used as a Tornado Shelter, Safe Room, Storm Shelter, or a Gun Safe.